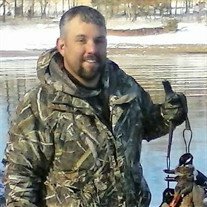 Christopher Ray Rye, 34, of Cross Plains, passed away on Friday December 14, 2018 at his home. Memorial services will be conducted Friday December 21st at 6:00 p.m. in the Oakhurst Chapel of the Robertson County Funeral Home with Pastor Derek Capello officiating. The family will receive friends on Friday from 2:00 p.m. until service time at the funeral home. Christopher was born June 27, 1984 in Davidson County. He was a graduate of East Robertson High School Class of 2002. He worked in construction and attended Northridge Church in White House. Christopher enjoyed hunting, fishing, reading, riding four wheelers, and being outdoors. He was a former member of Ducks Unlimited. Christopher was preceded in death by his grandfather: Archie Rye. He is survived by his mother: Sharon Barry Rye of Cross Plains, his father and step-mother: Donald and Tammy Rye of Springfield, his grandparents: Robert D. and Martha Barry of Cross Plains, Nell Rye of Springfield, his brothers: Jonathan Rye of Knoxville, Justin Rye of Springfield, step-sister: Samantha Adcock, his uncles: Scott and Bobby Rye, his aunt: Lori Rye Pratt, and his best friend, his chocolate Lab hunting dog: Bonnie.